A couple years ago exciting research findings sipped into the mainstream media – certain bacteria can turn toxic compounds into 24 karat gold nuggets!.. Because of their unusual abilities, the bugs have been studied extensively in the last few years. Just thought something you may find fascinating, never too late. These bugs are alchemists, successful alchemists. No, they cannot turn cyanide poison to gold, but they can turn toxic gold compounds, which are generally not economical to purify, into pure gold. Not that they want, they need to, to save their little lives. Yes, gold is a noble metal, too noble, or too good if you will, to mess up with other things, however, sometimes it makes exceptions and does react. When it does, it is typically with very reactive non-metals, and frankly, the compounds it forms may be lethal to most forms of life. The most prominent example of such gold compound is gold chloride. Deadly to majority of critters, but not the bugs. For instance, bacteria Cupriavidus metallidurans (let’s name it Bug #1) can handle the toxicity of gold chloride solution with ease and not a single cell gets damaged. How come? It engulfs, or simply eats, gold chloride molecules from its surroundings and through a series of biochemical reactions turns them to microscopic gold nuggets inside its body! In a lab, scientists used very high concentrations of this chemical. In natural settings, gold chloride is abundantly found in seawater, albeit in smaller concentrations. The nuggets this bacteria makes look a lot like regular gold nuggets found in nature – look at the above photo. Another bug that can manufacture gold in its gut is Deinococcus radiodurans (Bug #2). The science behind it was published just a month ago. A third bug called Delftia acidovorans (Bug #3) has a smarter way to deal with harmful gold compounds. Instead of eating the chemicals, it releases a molecule from its body that does all the risky work of converting them to gold nuggets. So, basically when this bacteria senses toxic gold compounds, it secretes a short-chain protein into its immediate environment which causes precipitation of gold, ultimately resulting in a work of gold specks. Pretty cool, ha? What’s interesting is, in nature, Bug #1 and Bug #3 live directly on top of gold deposits. Precisely, within the matrix called biofilm, you know, this slime that covers the rocks sometimes. All three bugs are not your regular germs living on your hands. Those would get knocked out right away. These ones belong to a group of bacteria called extremophiles – these critters are happy and alive in extreme spots around the planet. In abandoned mines choking with heavy metals, in boiling geysers, in saline, high-pressure oceanic waters – the environments where human and most other creatures would die or disintegrate alive. For many, many years, millions of years, extremophiles have been evolving the mechanisms to cope with the edges of nature… Some are discovered already but many more are still hiding from scientists – on land, in water, in soil, in permafrost. Of course in a lab, the conditions are made up and scientists literally were drowning the innocent bugs in toxic gold solutions. But in nature, the bugs can be found around more or less analogous conditions and they react in a similar way when near toxic gold compounds. What do you think this suggests then? Well, it suggests a link between the bugs and the gold deposits around the world. Check what 2016 Australian study has to say about this. There is a chance that gold in your ring was created by bacteria trying to save itself from death! Neat to know, you might say, what is practical side of all this? There are a few. 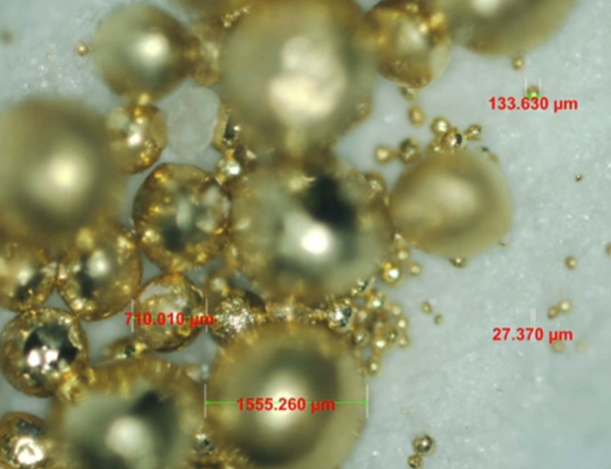 One day, these bacteria may help extract gold from sources that are generally left untouched. For example, gold mining leaves behind 20% of gold in low-grade ores and waste piles as it is not cost-effective to process them. Electronic waste is another generally unexploited gold source. Nearly in every corner of the planet dumpsters are overflowing with tons of electronic waste containing bits and pieces of rare metals, including gold. In fact, in total, the world dumps around 50 million tons of electronic waste per year. However, only about a quarter of this waste is actually recycled, meaning only a small portion of gold is recovered. Think about this – natural gold ores have 0.5–13.5 grams of gold per ton while a typical electronic waste dumpster harbours 10–10,000 grams of gold per ton! There is another potential way to use the bugs. 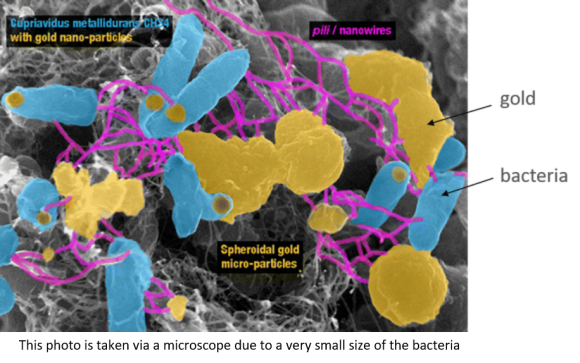 Because these bacteria can sense the presence of gold compounds, biosensors can be designed to detect gold in rivers, for example. Similarly, biosensors can pinpoint at the concentration of gold in environmental samples. The findings are promising but the discovery of tiny prototypes of King Midas is not a novelty – it was known before that bacteria can extract certain metals from solutions. Moreover, gold can be extracted from solutions by other means, for example, with potassium cyanide and electrical current. Yet, there is the advantage of putting the bugs to work. First, minimal intervention and supervision would be required. The colonies of bacteria can be thrown into waste piles, left for months and years and just periodically checked whether they excreted enough gold to harvest it. The other advantage, more obvious, is bugs would cause little or no harm to wellbeing of humans and environment. I checked for research updates, nothing about large-scale extraction of gold with the help of these bugs. So, that future has not come yet, just so you know 😉 . But scientists are working hard. For example, this 2015 study tests how good are Bug #1 and Bug #3 at making gold nuggets from electronic scrap. Glad if you enjoyed the golden bug tales… Show it to others!